Commercial compounds in original containers are properly labeled. If a commercial compound is repackaged or the original label is damaged beyond recognition, the container must be labeled with its contents and associated hazards using the hazard labeling system shown below. View a list of chemicals with their hazard symbols. If there is a chemical for which you need a hazard rating, please contact Ken Simolo at safety@chem.rochester.edu. All compounds for which the hazards are unknown are considered to be labeled with the "Universal Label," which is no label indicating hazards. All vials and other such containers that are not labeled with a hazard label shall be considered to be labeled with the "Universal Label." This "Universal Label" (which is no label) indicates a hazard rating of 3 in all hazard categories as described below. These vials and other containers must be handled with the Universal Precautions. All corridor doors to labs containing hazardous chemicals should have a large label describing the hazard labeling system. 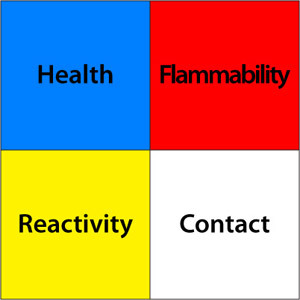 The Hazard Category Color System shown below is used for our hazard labels. This system is based on the NFPA system. In each category square will appear a number ranging from 0 (for low level of risk) to 4 (for high level of risk). This rating system is based on the J.T. Baker Saf-T-Data © System. The health category refers to the capability of the chemical compound to cause personal injury due to inhalation, skin contact, eye contact, or ingestion. The flammability category refers to the compounds ability to create or sustain a fire. The reactivity category refers to how reactive the compound is under normal laboratory conditions. Compounds that are likely to explode or react violently with air, water, or other common substances would be given a rating of 4, while extremely inert substances would be given a rating of 0. The contact category refers to how dangerous physical contact with the compound is under normal laboratory conditions. Compounds that are likely to cause severe damage or death when in contact with skin, eyes, or mucous membranes have a contact hazard rating of 4. The above descriptions are for general conditions and do not cover all possibilities. Take water as an example. Water has a health rating of zero and a contact rating of zero. However, a person could kill themselves by drowning, and boiling water or steam can be very dangerous with respect to physical contact. Therefore, under certain circumstances, water is deadly. Similar analogies are possible for every chemical. This just emphasizes that a certain level of professional understanding and common sense is required when handling chemicals.